The Bega river is more than 48km in length and the basin is 2,850km2. In its upper reaches the Bega river is also known as the Bemboka river. The Bega catchment is located on the far south coast of New South Wales. Bega has a catchment area of 2,850 square kilometres. 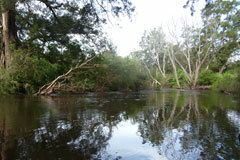 The Bega River starts at the confluence of the Bemboka River and the smaller Tantawangalo Creek. 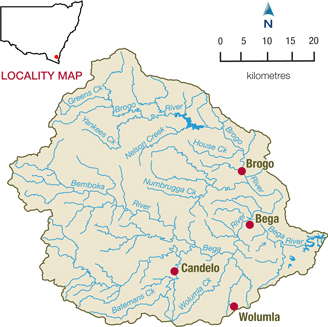 The Bega River has two major arms that meet 20 kilometres upstream from the mouth of the river: the Bega-Bemboka arm and the Brogo River arm with a further 120 square kilometres below the junction. The Brogo River joins the Bega River just downstream of the township of Bega. In addition to the Bega and Brogo catchments, the 'greater Bega Basin' includes some significant coastal systems - Narira Creek and Dignams Creek, which flow into Wallaga Lake, and the Dry/Murrah River system. View real-time data from the Bega catchment on this website. The Bega River is regulated downstream of Brogo Dam, but the rest of the catchment is unregulated. Most irrigation water licences are used for dairy farming. There are 96 dairy farms and 25,000 dairy cows in the catchment. Other water users include the Bega Valley Shire Council, cheese production, forestry, cattle grazing and oyster farmers. Except for Brogo Dam, most water users rely on natural flows or small structures, such as weirs, for water supplies. As in most unregulated rivers, flows are mostly affected during relatively dry times, when water is low and demand high. In recent years, the Bega Valley has experienced severe drought, which has reduced the volume of water available to licence holders and affected the health of the riverine environment. Sharing limited volumes of water fairly between competing users, such as local councils, farmers and the environment, is a key management issue during times of drought. The management of lands along river and creek banks is another important issue that can affect water flow and quality. For example, cattle grazing can damage sensitive riverbank vegetation resulting in erosion, and forestry can reduce rainfall run-off into rivers, creeks and streams. No threatened fish species listed under NSW legislation occur in the Bega valley. One threatened fish species, the Australian grayling, is listed as vulnerable under the Commonwealth Environment Protection Biodiversity and Conservation Act 1999. The Bega River estuary is a key environmental asset within the Bega valley.